Just a week after Brentford host Millwall in another London derby, the focus shifts to a far more localised affair. On 10 November, the Bees will visit Loftus Road for a second-tier match for only the eighth time, hoping to equal an all-time record of four consecutive visits unbeaten. Both sides have had indifferent first halves to the season and, while Brentford were once favoured in the betting for Championship promotion, they have since stumbled and former relegation favourites QPR could be looking to overtake them and push on. Last August, Brentford maintained their hoodoo over QPR with a 4-1 drubbing at Loftus Road in the EFL Cup. The last encounter here was certainly a memorable one. A midweek derby under the Loftus Road lights is always a spectacle to behold. After a goalless first half, it looked like it was going to be another damp squib, but a Danish dynamo would quickly change that. Whatever was said in the visitors’ dressing room at half-time clearly had a profound impact on Lasse Vibe, who opened the scoring just seven minutes after the restart. After Brentford weathered the expected QPR fightback, Vibe netted what appeared to be the killer second goal nine minutes from time. Rangers fans left in droves as their red and white counterparts partied in the visiting section, but on 93 minutes, QPR pulled a goal back. Matt Smith nodded home the goal that started the comeback, and then knocked down just a minute later, enabling Luke Freeman to pounce and equalise. With Brentford odds-on at most bookmakers to beat Millwall, prior to their meeting with the Lions on 3 November, there is clearly a lot of faith in Brentford when it comes to London rivalries. With Brentford also having odds of just 5/2 against their promotion prior to said clash, the informed neutral is currently far more inclined to use betting offers (such as a £30 free bet) to back Brentford rather than QPR. Fifteen years ago, however, there was no doubt at all as to which team had the greater standing. Back in November 2003, QPR were gunning for promotion, and hosted a relegation-threatened Brentford on Remembrance Day. While there was just one goal in this clash, the game was not short of passion. By this time, QPR were in the midst of their third season in the third tier of English football, and growing ever more adrift of its former heights. After an opening run of just one defeat in thirteen matches, QPR were on their own slide, having taken just five points from the previous twelve. It was Tony Thorpe who rose to the challenge, scoring two minutes before the break. Though Brentford put their hosts under immense pressure after it, the Hoops held out – and gained promotion six months later. With Brentford unbeaten in their last three visits to Loftus Road across all competitions, just one clean sheet on 10 November will be enough to see the club equal its existing record of four without defeat there. That record was set in February 1929, when both clubs occupied Division Three (South), which was then the third tier of the league system. Brentford also have the accolade of winning the only ‘hoops v stripes’ FA Cup derby ever played here, doing so back in February 1946. Gerry McAloon was in the midst of a heady season, and having turned around a 2-1 deficit in the second leg of the previous round with a hat-trick, scored the opener at Loftus Road. Fred Durrant and Dai Hopkins added the killer goals, with QPR producing only one in response. 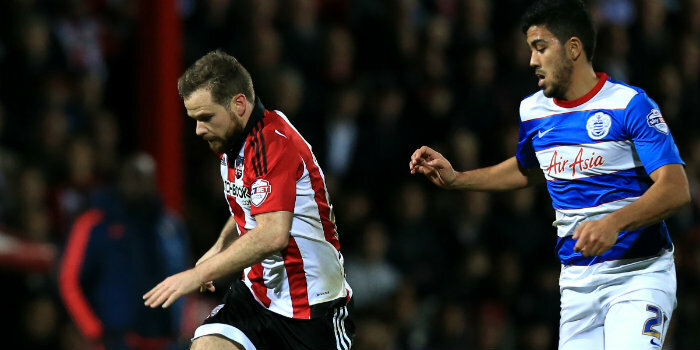 Brentford sealed progression to the sixth round after a 0-0 draw in the return leg.